A recently approved law in California aims to finally address the state’s loose governance of recreational boaters navigating its many waterways. Gov. Jerry Brown reportedly signed into law on Sept. 18 a boater safety bill requiring all boaters in California to be in possession of a Vessel Operator Card and pass a safety course. While the new law will help shore up safety concerns on California’s waterways, there are many common sense and basic steps recreational boaters and other aquatic users can take to ensure a safe coexistence, especially in busy places such as Newport Beach Harbor. Co-authored by state senators Bill Monning (D-Carmel) and Mark DeSaulnier (D-Concord), Senate Bill 941 specifically requires recreational boaters to pass a sanctioned boating education course and obtain a vessel operator card in order to operate a motorized boat. Both Monning and DeSaulnier pushed the bill as promoting boater safety and helping prevent common accidents. Though the new requirements do not take effect until Jan. 1, 2018, the California Division of Boating and Waterways (Cal Boating) will create a Vessel Operator Card to be issued only to anyone who provides proof they passed a sanctioned boating safety exam. Initially applying to boat operators age 20 and younger, everyone will be required to obtain a vessel operator card by 2025. With the new law, California takes itself off of list of five states – the others being Alaska, Arizona, South Dakota, and Wyoming – not requiring boat operators to take a boating safety course before operating a vessel. Though the new law is still more than three years away from being implemented, the authors and supports of Senate Bill 941 hope to address the nearly 200 to 500 boating accident injuries that reportedly occurred annually between 2004 and 2013. According to the U.S. Coast Guard, the top five primary factors contributing to a collision or accident were operator inattention, improper lookout, operator inexperience, excessive speed, and machine failure. The most common boating incidents involve a motorboat. Specifically, 46 percent of incidents involve a motorboat, compared to 18 percent for personal water boats such as jet skis) and 17 percent for cabin motorboats. Rachel Johnson, executive director of the National Safe Boating Council, said it is imperative to understand basic navigation rules. Also, someone onboard can help with navigation by serving as a lookout. She specifically pointed out the five contributing factors in a collision or accident and said a lot could be prevented with a basic understanding of what to do prior to and during your time on the water. “Each of [five contributing factors] tie into the navigation rules,” Johnson said, adding something as simple as wearing a life jacket could help reduce boating accident deaths. Specifically, Johnson said 84 percent of victims in boating accident deaths did not wear a life jacket. She also said to leave alcohol at the dock and always check weather during or before a trip. Weather could change at a moment’s notice, so it is essential to always be in tune with the most up-to-date conditions. Using the boat radio to call into the harbor is an easy way to stay in touch with those in the know of potentially changing weather patterns. Johnson also recommends all boaters filing a Boat Plan with a trusted person on dry land. If something were to go wrong and a boat does not return to harbor or shore, a boat plan could help authorities in their search. 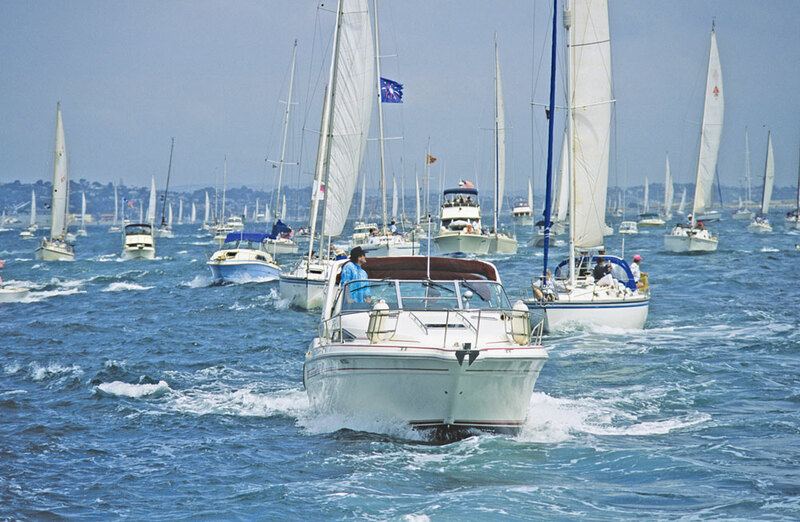 Adding a twist to the just-approved boater safety bill are potentially hazardous conditions in harbors and marinas with high volumes of traffic. Over at Newport Beach Harbor, some boaters are weary of standup paddleboard users and kayakers, many of whom are in the water amongst the boats and perhaps unaware of how to coexist with boats. Even more, Senate Bill 941 applies only to recreational boating, not kayakers, standup paddleboard users, or any others intermingling with the boats. Thankfully, there is at least an attempt on the part of some rental companies to educate its customers of how to safely recreate while in the water. Dave Dalzell, who manages Newport Boat Rentals with his father, said every renter who comes into the shop is required to first read a contract with detailed rules and regulations of the harbor. Once signed, the renters are then given additional instructions of how to navigate the harbor once on the boat, kayak, or paddle board. “If they actually read the contract, there is a lot of information there,” Dalzell said, adding about 50 percent of renters are novices. He added there were not too many complaints from boaters this year about kayakers, paddle boarders, or novice boaters, but there were definitely concerns last summer. Specifically, Dalzell said there were complaints of paddle boarders blocking the ferry lanes or getting in the way of large ships. Accordingly, renters are now instructed on what portions of the harbor they should avoid. Through it all, Monning believes the new boating safety law is a positive first step toward making California’s waterways a less dangerous place. In the past decade, legislators in Sacramento had twice approved bills similar to Senate Bill 941. However, former governors Gray Davis and Arnold Schwarzenegger reportedly vetoed the respective bills. According to Senate Bill 941, California’s Division of Boating and Waterways serves an estimated four million recreational boaters who in turn operate about 2.6 million recreational boats. Between 2011 and 2013, legislators estimated about 3,000 California boaters annually in a boating safety course. Recreational boating contributes several billion dollars annually to the California economy, according to the bill.